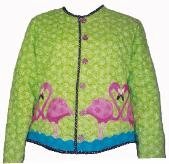 The Flamingo Jacket has cool colors and South Beach style! Applique a flock of brilliant pink flamingos front and back on a great looking fitted jacket - no darts and a flattering curved hemline. Pattern includes all sizes, XS-XXL, 4 to 26.